We want to inform that NAMSTOCK has been called off. 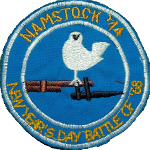 The scenario called New Year’s Day Battle of ’68 will take place later during the upcoming summer. The event will also take place in Bugaj near Poznań.